Whether you drive a foreign or domestic vehicle, regardless of how careful you are on the road, it will require attention and maintenance. Trust the professional auto technicians at AAMCO of Turnersville to help you successfully maintain it. We offer complete maintenance and auto repairs in Turnersville, all of which come backed with a comprehensive warranty. Spend less time with your car in a repair bay and more time on the road where you deserve. Whether you need transmission repair, an engine tune-up or your brakes inspected, AAMCO of Turnersville is the garage that does it all. 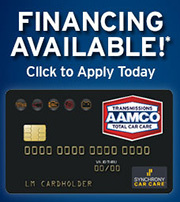 AAMCO Turnersville only hires the best. Our technicians stay up to date on all makes and models of foreign and domestic vehicles, including front-wheel drive, four-wheel drive, two-wheel drive, and all-wheel drive vehicles, light cars and trucks. We also service fleet vehicles, including box vans, cutaways, stake beds, and Grumman trucks. Nobody has time to worry about their car breaking down every time they get on the road. When you bring your vehicle into AAMCO of Turnersville, you’re not only getting exceptional service at a great price, you’re getting peace of mind and confidence knowing that your car will last you for the miles ahead. Our state-of-the-art diagnostic tools and equipment will give you peace of mind that any and all repair issues are correctly diagnosed. You can also relax knowing your car was in the best, most experienced hands, and that you weren’t taken advantage of, being sold parts and repairs you didn’t need. Because we understand that auto repairs rarely come at opportune times for most vehicle owners, we offer financing upon credit approval and free towing with rebuilt transmission service or any major auto repair to help make it more affordable. Contact us today for more details or to schedule your next auto repair in our facility! © 2019 AAMCO of Turnersville. All Rights Reserved.